With a new logo announced at Homestead yesterday - “The Grand-Am Rolex Sports Car Series presented by Crown Royal Special Reserve is the proper and official name of the series and should be used in all first references. 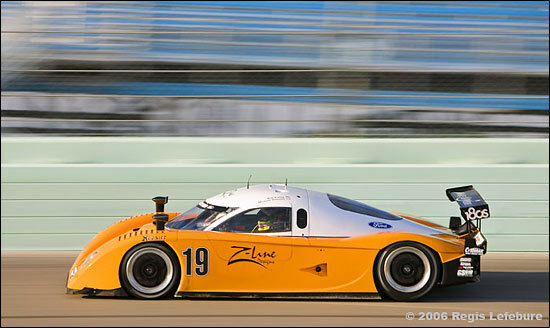 Acceptable second references include the Grand-Am Rolex Series or the Rolex Series” – Grand-Am is getting set for 2007. Grand-Am is always hyphenated. Grand American should no longer be used. The second day of the test typically saw faster times than on Tuesday, and fastest of all was, as on Tuesday, Michael Valiante in the #19 Finlay Crawford. He set a 1:13.884 on Wednesday afternoon, 26 thousandths faster than Max Angelelli, with Alex Gurney third quickest. In GT, Robin Liddell and Tafel Racing’s #72 Porsche was almost a second faster than anything else. GT report to come. Typically, Grand-Am’s test day material concentrates on the NASCAR drivers, such as Jimmie Johnson and Jeff Gordon. So lots of “fun” to be had – particularly if your regular ride is so cumbersome, presumably. Several more drivers from both NASCAR and open-wheel racing, are expected to announce their plans to compete in the Rolex 24 At Daytona in the coming weeks. Back to the front of the times in testing, and Michael Valiante said that “we’re really starting to get a handle on the car. The engineers and crew guys have been working so hard this year, and the speed is really starting to show. This is the perfect way to end 2006, and it gives us a little momentum heading into next year." It was no surprise to see Max Angelelli second fastest, nor Alex Gurney third. Patrick Carpentier was fourth quickest, Tommy Erdos fifth in the Cheever Crawford and Andy Wallace sixth in the Howard Motorsports Crawford – so three Crawfords and three Rileys in the top six. No, it wasn’t Tommy Erdos fifth – despite being listed on every time sheet, he didn’t travel to Florida. The third potential Cheever entry was being prepared for next month’s action, and didn’t appear – so it was presumably Christian Fittipaldi who was fifth quickest in #51. Best times are typically set on new rubber, but the Howard Motorsports Crawford only used four of the available six sets, and Andy Wallace was “really, really pleased with our speed”. Wallace was right up there on Wednesday morning – third fastest, less than a tenth behind Carpentier in #11 Riley, but the Crawford was on worn rubber, not new tyres. The #20 car didn’t fit fresh rubber in the hotter, afternoon session, when the quickest times were set, all on fresh Hoosiers. At Brumos, with its two Rileys, it seems that Roberto Moreno and Joao Barbosa will race with #59 car with its regular pair. Despite the ECU business settling down at this test, Brumos lost another engine at Homestead, following its dramas at Daytona last month. David Donohue / Darren law finished up seventh quickest. 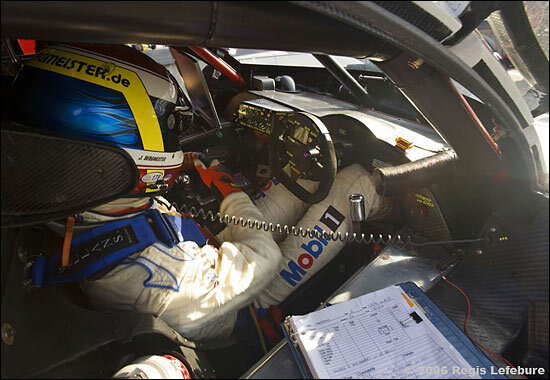 Alex Job Racing problems centred around fitting Joerg Bergmeister in the car (above). Cutting back the dashboard made it better, but still far from ideal, for the tall German champion. All that cockpit space, and he still doesn’t fit…. The #23 Crawford Porsche was eighth fastest, ahead of Bill Auberlen in the Sigalsport Riley BMW and Oswaldo Negri in the #60 Shank Riley. Chip Ganassi’s car was mainly used to try out Mexican partners for Scott Pruett, and was 11h quickest. Memo Gidley in the lone Doran (only non Riley / Crawford at the test) was 13th, behind the factory Riley. Down in 18th was the Canadian AIM Autosport Riley Lexus, a former Ganassi car, with Mark Wilkins joined by the Frisselle brothers. “This is our first time running the five-liter Lexus and the new Bosch system, so we just wanted to get down here to work out the bugs so we can be ready to get down to business at Daytona in January,” said team manager Ian Willis. The next test will be the big one – at Daytona, January 4-6. No doubt by then there will be a whole host of additions to the driver line-up, from other categories. GT round up to come.